This article is a fitting follow-up to the previous one, the topic of which was utilizing the proper spot drill in order to cut a straight hole. There, I mentioned subsequent tools (taps and reamers) that enter the hole created by the drill and the typical issues these tools will run into if the hole isn’t straight. Manufacturers of reamers will suggest how much material to leave for the reamer to cut properly. The amount to leave is based on the material being reamed in a diameter range such as 1/8” to 1/4”, 1/4” to 3/8” and so on. Obviously, the straighter the hole is the more consistent the reamer will cut as it goes into the hole, producing the diameter you expect it to. How much material should be left for a tap? The amount to leave in a hole that will be tapped is based on the type of tap (cut tap or roll form tap) which have their own effective thread percentage guidelines. A cut tap will require the hole to be drilled to the minor diameter of the thread specifications. The effective thread percentage of a cut tap is 75%. A roll form tap requires the hole to be drilled to the pitch diameter, basically in the middle of the minor diameter and the major diameter of the thread specifications. The effective thread percentage of a roll form tap is 65%. So you pull out your favorite drill company’s decimal equivalent/metric conversion/ tap drill chart and by their guidance, you use the tap drill they recommend for the thread you are making. But WAIT !!! Did you calculate the TRUE HOLE SIZE by the suggested effective diameter percentage? Did you assume the recommended drill size will provide the correct percentage? This might be why you have reoccurring issues in certain thread sizes you tap. Below is a chart I created that shows a range of some popular fine and coarse “inch cut tap” specifications. 75% is the target. The drill chart I used suggests the drills in the column titled “Drill Chart Drill Choice”. The column titled “Drill Chart Percentage” is the actual percentage when the suggested diameters are calculated for each thread size. 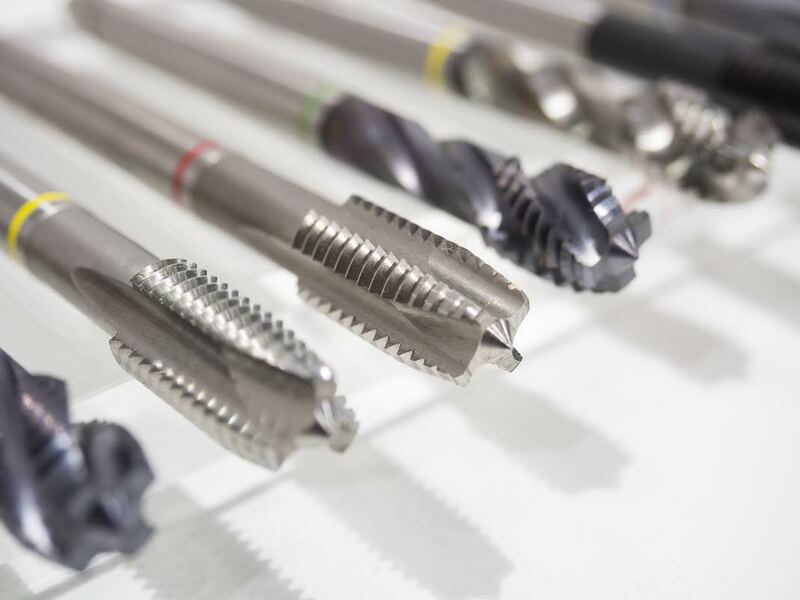 As seen in the Far Right column, “Closest MM Drill,” by utilizing metric drill diameters you will be able to go between basic inch drill sizes to achieve the 75% target for inch cut taps. If you review the thread sizes you have the most trouble with and notice they are ¼”-28, 3/8”-24, ½”-13 and 5/8”-11 threads you can now see why. RED is a TIGHT Hole. If a no-go thread gage is something you’re fighting on a regular basis on 9/16-18 and 5/8-18 threads you can see the problem there too. PINK is a LARGE Hole. In the smaller thread ranges (1/4” threads and smaller) the actual difference in diameters between the correct and incorrect percentages are minimal. In miniature threads, sizes as small as .0005” can equate to a huge percentage. Now, let’s go all the way back to the spot drill again. A miniature spot drill will have a thinner web than larger spot drills. This thin web will produce a fine, smooth point for the miniature drill to make contact with, thus penetrating straight for a nice quality hole for the miniature tap to follow. This produces a quality thread more consistently and achieves the best tool life possible.